Mark highlighted the phenomenon of the Autumnal Patent “Hook” at the SIPO in his blog posted early last year. 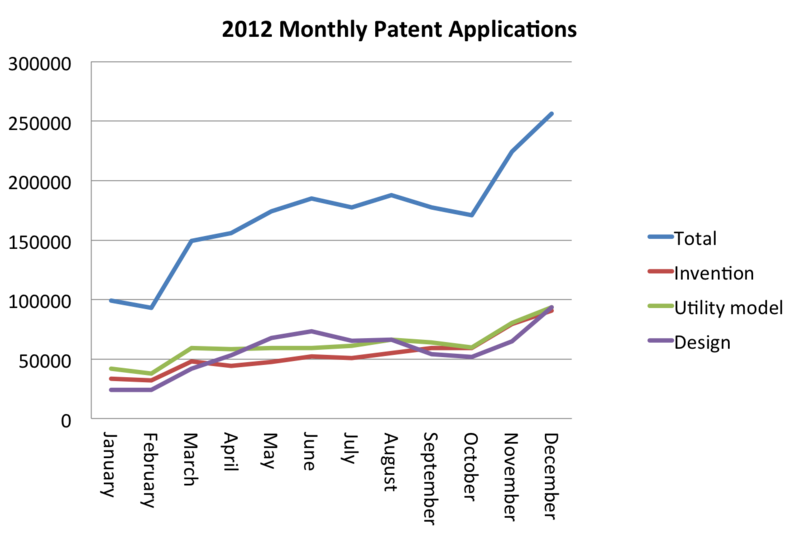 The data on 2012 patent filings at SIPO again shows the same pattern (see the graph below). My colleagues at UC Berkeley and I conducted a study on the seasonality of patent filings at the SIPO, which confirms Mark’s insightful observation. Our study involves monthly patent filings at the SIPO from 1986 through 2007, and we compare domestic filings with foreign filings. We find a much stronger surge in December for domestic filings after 2001, when China started to encourage innovation and patenting. Based on the grant rate and first year renewal rate, domestic firm filings made in December after 2001 seem to be of lower validity and lower value. We posit that one plausible explanation of the surge in domestic patenting in December is that domestic firms were under political pressure to meet yearly quotas set by the local governments. More on the developing trends in China related to Intellectual Property from the prepared remarks of Teresa Rea, the Deputy Under Secretary of Commerce for IP, delivered at Fordham Law School on January 28, 2013. This entry was posted in China IPR and tagged design patents, Invention Patents, patent applications, Quotas, SIPO, UMP.